Do you recall? The most famous Reindeer of all?! 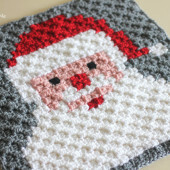 Yes, it’s Rudolph the Red-Nosed Reindeer peeking out of the corner of this cute C2C (corner-to-corner) blanket! 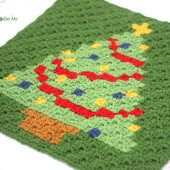 I know we only have about a month until Christmas, but this pattern is pretty easy because there aren’t a whole lot of complicated color changes. I actually didn’t have that many ends to weave in! The finished size is approximately 35 inches x 32 inches. This is great lapghan or childs blanket size but you could absolutely make it bigger if you wanted to by increasing the border or using DC stitches instead of the HDC stitches that I used. UPDATE TO ADD: Fellow crocheter Jennifer Burgard has graciously taken the time to write out all the color changes in an easy-to-follow PDF! Download it for free HERE. Sample of page of 1 of the written color change pattern is below 🙂 Thanks so much Jennifer! After you have finished the main blanket, you can choose to add a border or leave without a border as pictured above. With green, SC between between “squares” on edge and chain two in-between. So you will SC +chain 2 + SC all the way around, making a SC +Chain 2+SC all in one stitch in each corner. Then with green, make 2 HDC in each chain 2 space all the way around the blanket. Make 2 HDC + chain 2 + 2 HDC in each corner. For the last round of the border, switch to red yarn and SC in each stitch around making 2 SC + Chain 2 + 2 SC in each corner. Fasten off and weave in ends! 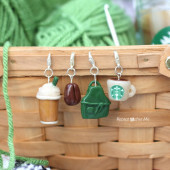 Gingerbread Crochet Hook is from The Polymer Clay Shed. Shop the Hooks HERE. Not a great photo (taken with my iPhone) but below you can see Zoe holding it up for size reference! She is 4 years old. Amazing blanket. It gives me a smile on my face. Thanks so much for sharing this pattern. I love this! Thank you…. I really like this technique, it works quite fast. I wish I had the time to do it. Hi. Thnx for the great pattern. Sooo cute. I have started this and I’m right in the middle of the work, but I feel it’s much too smaller than I expected size of a pillow maybe! How would one make this in a size that’s closer to the average afghan size? I’m working on projects to decorate my new home for the holidays and this looks lovely! Could you email the pattern? Would love to learn how to crochet this. Thanks! This is simply adorable!!! Can this be enlarged? And if so how would I go about doing it. I noticed at the end of the written pattern DMC embroidery floss was listed as a supply, but did see a mention of it in your post. Did I miss something? I love your pattern – thank you for sharing it. If you know that the function of explorer then http://fileexplorerwindows.com then i have to tell you that its latest version will also coming and in this version it is totally changed from the previous. I did you Rudolph blanket and absolutely love it. Wondering if you have one of half a Santa face by chance? 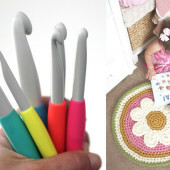 Will this work for left handed crocheters? I just made this as a baby blanket for a new baby boy. The mother loved it! Thank you so much for sharing this fabulous pattern! I’m in need of help I’m trying to do your reindeer c2c graphgan, and I’m stuck on the first set of decreases. I know how to do the c2cs but on a graphgan I’m so confused. Could you please help? Could you please clarify what you mean when you say “decrease from the left” or “decrease from the right”? I don’t see any tutorials that mention it. For decrease they mention to slip stitch across the last square instead of chaining 2 but it appears you do that from both sides. Please clarify. Thanks. Hi I am having trouble reducing properly. I’ve watched the video and understand how to reduce but the pattern isn’t lining up right. Can anybody help me! I don’t want to stop this blanket but I am quite stuck. Take surveys and win ultimate prizes at patron survey official website.